Mazda Europe LHD 2018, original spare parts catalog for Mazda automobile and MAZDA minibuses with the left rudder., MAZDA EPC, Mazda original spare parts catalog for Mazda automobile and MAZDA minibuses, Mazda left rudder Electronic Spare Parts Catalogs, Service and Workshop Manuals, Service Information, Wiring Circuits and Hydraulic Shematic Diagrams, Diagnostic equipment. Original spare parts catalog Mazda EPC contains the full information on cars and minibuses with the left arrangement of a rudder, since 1985. It is delivered on two CDs, at installation borrows 70 Mb, works with use of CD. 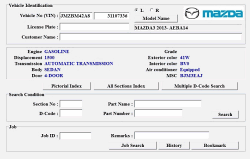 In the program Mazda EPC there is a search on VIN, on model of the automobile, under original number of a detail, there is a function of conducting Job-sheets. After installation the program Mazda EPC creates two directories EPC and Mazda, directory Mazda contains the program showing working methods with program Mazda Epc and telling about history of mark Mazda, in directory EPC there is program Mazda, is started by a file "Epc.exe". Work with the program Mazda EPC is carried out by means of function keys and the mouse. Depending on a window of function of keys change. All function keys are described in Help-e programs and explanatories on the bottom panel of function keys of the program are supplied brief. For the beginning works with the program it is enough to know one function key "F5", after input VIN or a choice of model, it is a key deduces a window of groups of spare parts. Installation Mazda LHD / RHD / Japan on one computer. At installation is created the ini-file of adjustments radically systems (varies).